The Perfect Activity Toy For Energetic Kids! Are you looking for a way to keep your child active and in shape? Do you want your little ones to grow strong and be able to defend themselves? Do you want to help your kids relieve their stress and anger? The Hoovy inflatable punching bag for kids is everything you've been looking for! Children need to move, play and have fun and what better way to do so than jumping, kicking and punching this awesome boxing bag? The inflatable punching bag for kids is incredibly fun for boys and girls of all ages as it will keep them active in the best way possible! 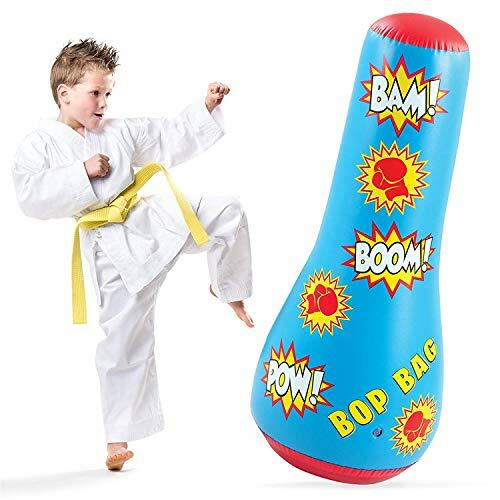 With the bop bag your kid can re-enact their favorite action movie scenes and punch just like a superhero! Children can sometimes be under a lot of stress and they too need some relief, just like you do! With this punching bag your kids can let go of their anger and stress in a safe way, so they can be relaxed, happy and peaceful! The toy punching bag for kids is made with special attention to detail and with the best quality materials for perfect results. This bop bag is made with heavy duty vinyl that is very strong, yet soft so it will not hurt your child's knuckles and hands. It is very easy to blow up and it will stay inflated for long for your convenience! MAXIMUM FUN: The inflatable punching bag is perfect for all kids. This boxing toy will help boys and girls have fun, stay active and exercise, increase their speed and strength, and find relief for their stress or anger in an athletic and safe way. PREMIUM QUALITY: The inflatable youth punching bag is very easy to set up and it is freestanding for your convenience. It is crafted to perfection with the finest quality vinyl that is strong and soft so it will not hurt your child's knuckles. AWESOME DESIGN: BOOM! BAM! The bop bag has a fun design that looks like it just came out of a superhero comic! It is colorful, cute and perfect for children and toddlers of all ages, girls and boys, so it will look awesome in every nursery. PERFECT SIZE: The blow up punching bag was specially designed to be perfect for kids and toddlers. The self-standing boxing bag for boys and girls is 16.7'' long, 17'' wide and it has a height of 44'' so it can be easy for little children to punch. RISK-FREE PURCHASE: Your satisfaction comes first and this is why we strive to provide you with the best quality products and service. We back our inflatable punching bag with a 1-year warranty, so if anything goes wrong, simply contact us! If you have any questions about this product by Hoovy, contact us by completing and submitting the form below. If you are looking for a specif part number, please include it with your message.